From sleeping in to brunch with friends, millions of Americans choose to skip church on Sundays. On Sunday mornings, Jill Taylor drinks coffee and listens to the blues or Johnny Cash. Allen Glendenning reads or calls his kids. Andrew Jacobsohn sleeps late and then studies for school. For them, Sunday is a day of rest. But it’s not a day for church. All are among the millions of Americans who rarely if ever go to church. Their reasons for skipping church are complicated. For some, it’s a loss of faith. For others, a move or conflict within the church kept them away. Some simply lost the habit of churchgoing. Going to church, it turns out, is harder than it looks. And even for those who miss church, going back would be difficult. By listening to the unchurched talk about what keeps them from the faith and going to church, we can identify some of the barriers that we and our churches can strive to dismantle. For Allen Glendenning, leaving church came after a crisis of faith. He’d grown up in the Church of the Nazarene, graduated from a Nazarene college, and joined the choir at a local Nazarene church. He’d even served a term on the church council. Yet over the years, doubt crept in, especially as his kids decided Christianity was not for them. About 10 years ago, he walked out of church and never came back. He doesn’t believe in God. And, like many Americans, he doesn’t worry about life after death. LifeWay Research found that about 4 in 10 unchurched Americans never wonder if they’ll go to heaven when they die. “That’s just not a question I think about,” he says. Glendenning misses some parts of church. He loved singing in the choir and being part of a larger community. His dad and brother are Nazarene pastors and most of his family belongs to that denomination. Leaving church meant leaving a community as well as faith. “I miss that I could walk into a Nazarene church anywhere and chances are I’d know someone,” he says. Now 58, Glendenning spends his Sundays reading, thinking, or binge-watching television. Once in a while he visits the Kansas City Oasis, a gathering place for nonbelievers that’s part TED talk and part house concert, as the Kansas City Star put it. There are doughnuts, coffee, singing, and conversation but no faith. Glendenning says he could go back to church, sit in the choir and keep his lack of faith to himself. But that seems dishonest, he says. Jill Taylor is trying to sort out her relationship with the church. Her dad was a pastor, and she was married to a pastor for about 15 years. Their marriage started to fall apart about 10 years ago, right around the time he left the ministry. For a while she went to a nondenominational church as she tried to adjust to her new life. But she could never get connected. Taylor later attended a church plant and then a congregation near Aurora University in Illinois, not far from where she lived. But her daughter had a hard time fitting in and so Taylor ended up not staying. As a single parent in church, she often felt out of place. At the time, she was grieving the end of her marriage as well as the loss of her place in ministry. As a pastor’s wife, she had been seen as valuable. As the ex-wife of a former pastor, she was not. She felt people often wanted to set her up with someone, as if marriage would solve her problems. Now in her early 50s, Taylor is reconsidering church. She’s found a congregation she likes and has visited a few times. But she’s not ready to dive in yet. One reason is her personality. She’s an introvert by nature and it takes time for her to connect with new people. She’d rather observe for a while first. “I keep everyone at an arm’s length,” she says. For Megan Barrett, Sunday is a day to hang out with friends. She gets up early, makes a big breakfast, then takes the kids out to the park or hosts a get-together with friends—especially friends who don’t go to church, since they’re always free on Sunday mornings. Barrett’s explanation for staying home is straightforward. “I don’t believe in any specific god,” she says. Barrett, a physical therapist in rural Kentucky, enjoyed going to church as kid. Her parents believed in God but didn’t attend, so she went with friends instead. The activities were always fun, she says, and she wanted to fit in. Almost everyone she knew went to church. Looking back, she says, she went to church because she felt she was supposed to, not because she believed in Jesus. Once she read the Bible for herself, she started to have doubts. She loved science and math in school but felt her church looked down on education. And while people at church loved to wear WWJD merchandise, Barrett says, they didn’t seem to do what Jesus would do. She eventually stopped going to church. Barrett, who describes herself as a humanist, says she’s careful about sharing her disbelief. In her part of the world, people who believe in God are good, and those who don’t aren’t. She’s hasn’t completely ruled out going back to church in the future. But she says her return is highly unlikely. Most Sundays, Vicki Watson is either out for a run or drinking a cup of tea rather than sitting in a pew. However, not long ago, she was very involved in church. Watson’s doubts about going to church began during a debate over a church building campaign several years ago. Some members of her church wanted to spend money to expand their facilities. Others thought the money would be better spent on community outreach. That didn’t work for Watson. She believed serving the community was part of the church’s mission. Why are so many people missing it? she wondered. Then she looked at her own life. A Biola grad and manager at a California tech company, she’s a Type A personality and a hard driver. She didn’t see much evidence of the fruit of the Spirit—like love, joy, peace, patience, kindness, gentleness, self-control—in her own life. “I thought, ‘I’ve spent all of this time in church trying to be a transformed person, and I don’t feel like I am making very much progress,’” she says. So she began to look outside the church for ways to serve. She wanted to spend less time talking about Jesus in church and more time trying to live out His teachings. Along with some friends, she helped start a local nonprofit that works with the homeless. Watson and other volunteers support people as they transition from the street into a permanent home. They focus on the small things: helping folks move into their new home, providing basic household supplies, and driving them to medical appointments. Watson still believes in Jesus. But she’s come to believe that going to church is bad for her soul. For Andrew Jacobsohn, a college student in Nashville, Sundays are for sleeping in, hanging out with friends, catching up on homework, and putting the busyness of life on pause. “It’s a chance to breathe from all the craziness,” he says. Growing up, the only time Jacobsohn ever went to church was when he had to. His parents attended services a few times a year, mostly at Christmas or Easter, and the Catholic school he attended held mandatory Mass about once a month. Jacobsohn didn’t mind going to church. But it was never his thing. So he’s given it up completely since leaving for college three years ago. It’s not for lack of options. When people at school find out he skips church, they ask him to go with them. He politely declines. “I’m just not interested,” he says. Skipping church doesn’t mean he ignores matters of faith. He’s read the Bible and studied theology in school and gets annoyed when his churchgoing friends think he doesn’t know anything about Christianity. He’s heard the Christian message and isn’t buying it. Jacobsohn says he’s thought about the meaning of life and what happens after death. So far he hasn’t figured it out. That doesn’t bother him. “I am OK with not having a clear answer,” he says. BOB SMIETANA is former senior writer for Facts & Trends. In September, Bob joined Religion News Service as editor-in-chief. As I work with many “ex-church goers”, I think it’s important to note the high degree of variance within the actual church experience itself. An important factor influencing the “sleep in on Sunday crowd”, who may earnestly wish to find a meaningful spiritual community, is their frustration and disappointment once they do attend. Sometimes the minsister and his or her verbose message appears to be more about their own inner conflicts, struggles or narcissism, than about a divine and benevolant reality that permeates the sun and stars and plants and you. Sometimes the message is about “who’s in and who’s out” or other dualistic interpretations of reality. Sometimes God is presented as the eternal score keeper, fittingly standing in for the harsh, judgmental parent, now interalized as the harsh, judgmental superego. One person recently ventured to a service, only to be swarmed by volunteer squads armed with clipboards ready to intimidate her into “service”. Sometimes Church systems mirror family systems in that they can be dysfunctional: undlear boundaires, divisions in leadership, competing power centers,acting out siblings who are left unaccountalbe to the authorities, etc. The recent rise of hypster churches where one can order a latte while listening to “light rock” and a “light message” may not appeal to those wanting intellectual rigor while dealing with their trauma, pain, loss, marginalization, or despair. Yes, some have lost faith. Some would rather sleep in and don’t get too worried about ultimate questions, and some find alternate activities and communities that fulfill their need to connect with others. However, some who are earnestly seeking a meaningful incarnate experience of the divine reality may find something quite different once they do step foot through the door. I would have liked to share this article but it ends without page 29 from the magazine. I feel like sharing the article without some ideas of what we need to do or what we could do differently to reach the unchurched will only create frustration on the part of the reader. I will also go back and add a link to those at the bottom of this article, so you can easily share both. 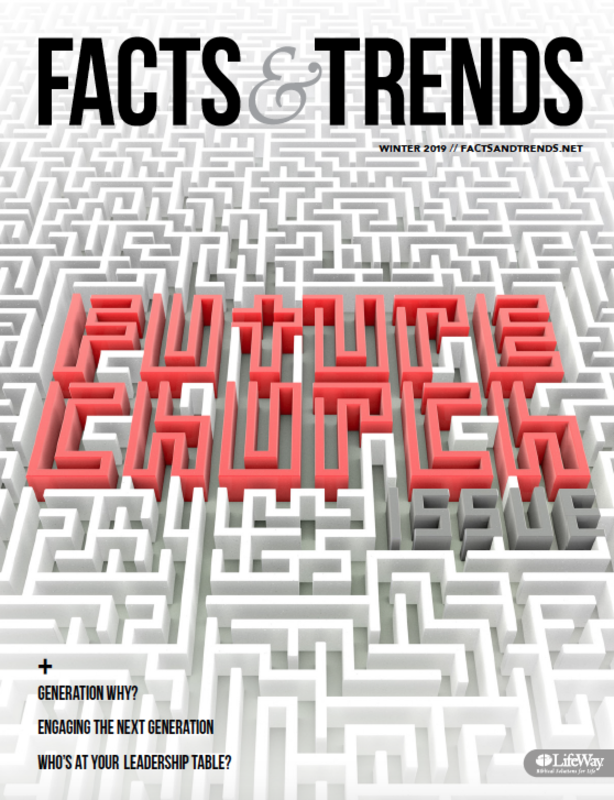 You can also go to http://factsandtrends.net/unchurched/ to see links to all our cover stories from this past issue.